Ginseng contain naturally occurring ginseno-sides and flavonoids. 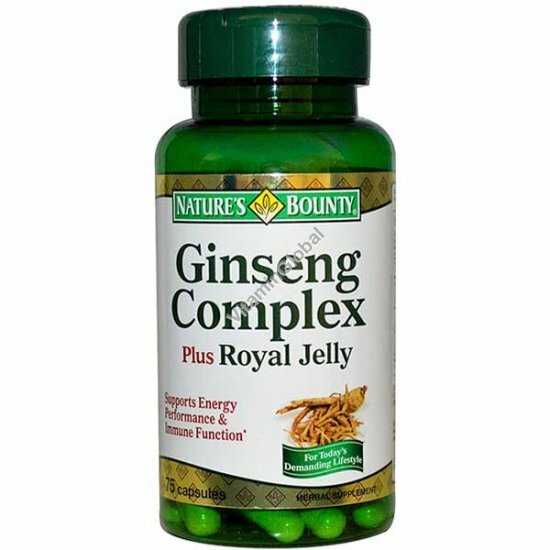 Nature's Bounty's blend of Panax, American and Chinese Red Ginseng forms a unique supplement designed to support physical performance and immune function while helping to release your natural energy. Other Ingredients: Rice flour, gelatin. Contains <2% of: mannitol, silica, vegetable magnesium stearate. No artificial color or flavor, no preservatives, no sugar, no milk, no lactose, no soy, no gluten, no wheat, no yeast, no fish. Sodium Free. Warnings: Not intended for use by pregnant or nursing women. If you are taking any medications or have any medical condition, consult your doctor before use. Avoid this product if you are allergic to bees and or bee products. Not intended for use by persons under the age of 18. Keep out of reach of children.